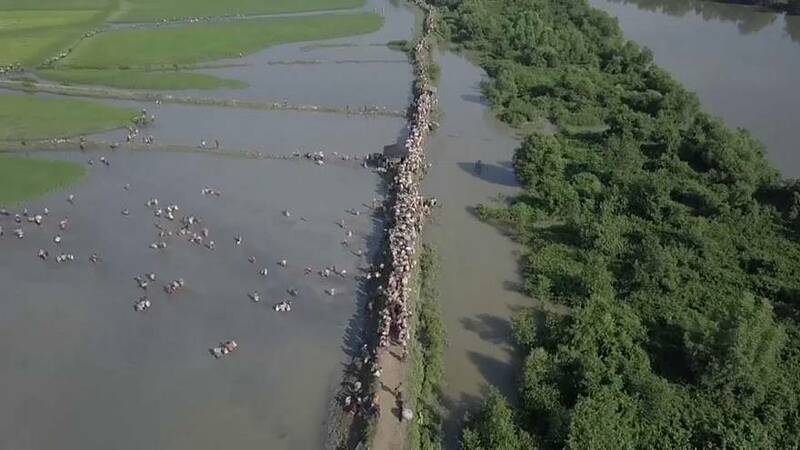 Aerial footage released on Monday by the UNHCR shows streams of Rohingya refugees carrying their belongings on foot, continuing their forced exodus from Myanmar to Bangladesh. The UN Refugee Agency say more than 500,000 Rohingya refugees have crossed into Bangladesh in less than five weeks. The refugee crisis started on 25 August, when the military launched a crackdown, condemned by the United Nations as “ethnic cleansing”. A funeral service was held in Shah Porir Dwip, Bangladesh on Monday for an unidentified man who died last week when a boat carrying Rohingya Muslims fleeing Myanmar capsized. On Monday, an overcrowded boat carrying refugees capsized in the Bay of Bengal near a Bangladeshi fishing village, killing 12 people, including six children.